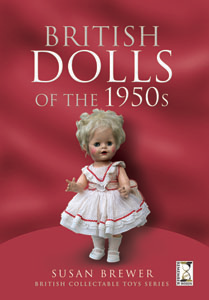 This book looks at British dolls of the 1950s and explores how a new material - plastic - revolutionised the doll trade and made dolls affordable for people of all classes. Nowadays these dolls are very collectable and the author concentrates on the nostalgia elements as she looks at the manufacturers of the time such as Pedigree, Rosebud, Palitoy, Roddy, Sarold, Tudor Rose and others. Here are all the 1950s classics - Elizabeth, Saucy Walker, Little Princess, Palitoy Girl, Babykins and Pretty Peepers as well as dozens of other favourites. 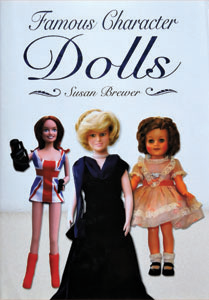 This is the follow-on book to the popular "British Dolls of the 1950s". 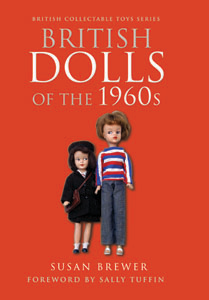 Focussing on the area of British dolls of the 1960s, it explores what to collect and why, and contains plenty of anecdotes and doll lore. It also looks at outside events such as the growth of the pop scene and how dolls were aimed at the newly-created 'teenagers', and not intended solely for children. These toy and pop dolls are now very collectable, partly because of the nostalgia element - many of the collectors would have grown up with them and so now desire them. The book will also appeal to other types of collectors including fashion aficionados and pop fans, as well as social historians. Sue also investigates the various doll manufacturers, and includes must-buy dolls, what to spot when buying dolls, retro dolls and safe cleaning. What makes a doll famous? It can be for a variety of reasons. Maybe the doll has been featured in a book, as in the case of Raggedy Ann, Little Noddy, Edith the Lonely doll and Pinocchio, or perhaps the doll is based on a book character such as Pippi Longstocking, Heidi, Matilda and Christopher Robin. Some dolls depict historical characters while others are representations of nursery rhyme figures, fairy tale characters or famous film stars. Pop stars are frequently portrayed in plastic - this kind of doll is short-lived because it is invariably on sale for just a brief time and once the star fades, the dolls disappear. Animated films, such as Toy Story, often include famous character dolls, while they can also be found in the world of advertising, dressed as royalty, in children's television, films or wearing national costumes. This is the first British study of its kind to focus on toys made for girls, including the spin-off accessories. It encompasses many kinds; dolls, houses, prams, cuddly toys, outdoor toys, traditional playthings and character toys. 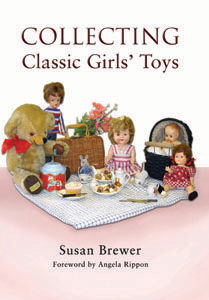 Each chapter is devoted to a different subject; amongst the topics covered are 'Caring and Cooking', 'Houses and Homes', 'Traditional Toys', 'Cuddlies and Character Creatures' and 'Outdoor Play', and the book describes hundreds of different toys loved by young girls over the decades. Included is a wealth of fascinating detail as well as a directory of manufacturers. The 1970s and 80s saw an influx of character toys - toys that often had their own invented world complete with accessories, pets and friends. Strawberry Shortcake, Rainbow Brite, Care Bears, Flower Fairies Moondreamers and Lady Lovelylocks were just a few of these. There were also dolls such as Holly Hobbie, Sarah Kay and the enchanting Victoria Plum who accompanied the stories written by Angela Rippon. Angela has written the foreword for this book. 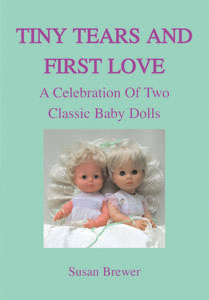 This is the story of two classic British baby dolls, Tiny Tears and First Love. It investigates the design, development and manufacture of the various types which have appeared over the years. Many of the earlier dolls are now becoming collector's items. The book is colour-coded to help identification. It is divided into two main sections, blue for Tiny Tears, pink for First Love, and then further sub-divided by colour to indicate the different manufacturers. The various versions of the Tiny Tears and First Love dolls are fully described and photographed, while separate chapters show body types, components, eyes and identification marks, as well as outfits and accessories. Other items of interest, such as instruction leaflets and logos, are also included. Family members of Tiny Tears and First Love including Timmy, Katie, My First Baby, Teeny Tears and Teeny Weeny Tears, are fully described, as are many of the related dolls which appeared under the Tiny Tears or First Love brand names. 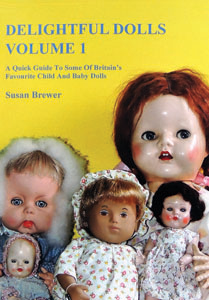 Delightful Dolls is a quick look at 80 or so favourite child and baby dolls that have been enjoyed by British children (and collectors) since the early 1950s. Some of the articles featured have appeared in Doll Showcase magazine or in their Kindle publications, but there are many more new entries. 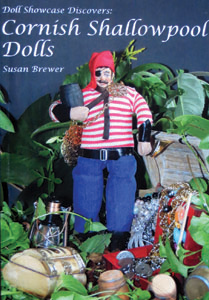 Illustrated with plenty of photos, it should help with identifying dolls found at car boot sales and flea markets. Amongst the 80 dolls featured are: Annie, Baby Alive, Baby First Step, Baby Sarah, Babykins , Blythe, Carrie and Christopher, Chatty Cathy, Crissy, Cuddle Up Baby, Dollie Walker, Dolly Surprise, Elizabeth, Galoob Ballet, Goldilocks, Katie Kopycat, Kiss Kiss, Linda, Little Princess, Little Sweet April, Matilda, Miss Rosebud, Palitoy Marcher, Peek-a-Boo, Penny Puppywalker, Petal Skin, Pretty Peepers, Rosebud Miniatures, Sasha, Saucy Walker, Thumbsuck Baby, Tonie and Sally, Tracy Tea Party, Victoria Rose. Years ago, visitors to Cornwall were delighted by the dozens of handmade character dolls on sale in local shops. When they asked who made them, the story was always the same - 'three elderly ladies', but no-one seemed to know who the ladies were. Today, collectors often come across these unmarked eight-inch-tall dolls, dressed in British regional costume with heads, hands and feet of plaster, and with padded bodies on a wire armature. The dolls, with their detailed hand-painted faces and beautifully styled hair, were made by Shallowpool Handicrafts. In this book, the first of its kind to concentrate solely on Shallowpool dolls, Cornish maidens, miners and fisherman rub shoulders with Elizabeth I, Henry VIII and Queen Victoria, and there are costume descriptions and accessory details. Dozens of full-colour photos illustrate a variety of the characters, from Cornish Workers to Nursery Figures, and from Historical Greats to a collection of Shallowpool dolls depicting centuries of fashion that have never before been seen in print. In addition, there is a history of the making of the dolls, and of how those three elderly ladies came together to create a series of delightful characters which are now sought after by collectors. The Amanda Jane Company was formed in 1952, originally to produce a wide range of dolls clothes, but later it began making dolls too, in particular the hard plastic Jinx and the Amanda Jane series of small dolls. This is the story of the company, the dolls and the outfits, and was written with the approval of Peggy Woollett, who ran the company for over 40 years, and Elsin Rawnsley, the founder. In the early 1980s Hornby Hobbies created a popular range of small vinyl dolls based on the Flower Fairies books and paintings by Cicely Mary Barker. 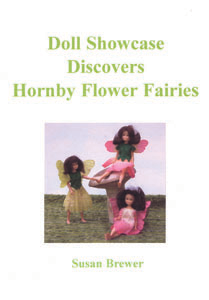 This comprehensive booklet contains a colour-illustrated id guide to the Hornby fairy and pixie dolls, including the deluxe and doubles sets. Also included are accessories, costume descriptions, packaging, rarity guide, Star Fairies and a Hornby Flower Fairy checklist. Written with the approval of Simon Kohler, Group Marketing Manager - Railways, Hornby Hobbies Ltd. Over 150 colour illustrations. A look at the tradition of the placing of a fairy doll on top of the Christmas tree in Britain. Originally, the fairy was a pagan belief, and it was believed holly was where the fairies slept. Hundreds of years ago, holly was used to decorate homes for the winter festival, and of course, is still used today. The Christmas tree was popularised during the reign of Queen Victoria, but an angel normally topped the branches. 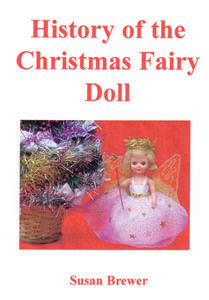 This booklet looks at how the fairy tree-topper evolved, examining different types of fairy doll, such as wax, bisque and plastic. It also includes step by step instructions for dressing a fairy doll in traditional style.